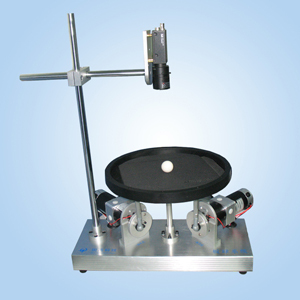 The ball and plate system is a multi-variables, non-linear control target, which is the 2D extension of ball and beam system. The control target is a plate with 2 mutually perpendicular rotating axes, with the aim of balancing a free rotating ball in a specific position on the plate, or having it rotating in a specific trajectory. The rotation of the plate along X-axis and Y-axis are driven by 2 motors, the vision sensor obtains the position of the ball on the plate and feedback to the control system, certain control strategies are applied to control the board for rotating angles along X-axis and Y-axis by the control system, and thus the balancing position and the motion trajectory of the ball on the plate is achieved. Position of the ball is detected by visual device. open architecture PC based motion controller platform. System is easy to control, operate and safe to use.